Looking for a convenient way to write down ideas and take notes during meetings? 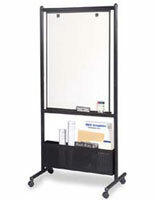 Flip chart stands help keep track of the important details in offices, schools, and at seminars. These write-on pad displays make it easy to record the conversation and highlight the main points. 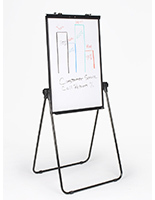 Flip chart stands are excellent for classrooms, conference rooms, and meeting halls. These note taking fixtures are made of steel and aluminum for stability while writing down information. 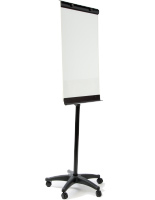 Our flip chart stands are offered with a number of options that still keeps them relevant in the digital age. 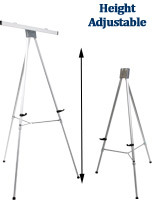 What types of presentation easels are available? 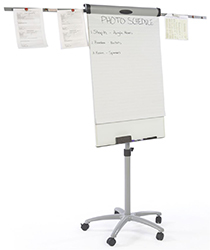 Flip chart stands are compatible with standard 2-hole paper pads. Some models have a clamp at the top that holds sheets in place, with or without perforation. Our tripod models have a collapsible design that makes them great for transportation. Simply fold up the three legs for a compact design that's easy to carry and fit into vehicles. No tools are required to assemble or disassemble these portable note taking tools. 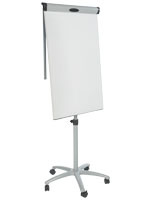 Height adjustable flip charts are ideal for accommodating different environments. Professors in large lecture halls may need a taller display that everyone can see, while conference rooms require a short angle that's more accessible. 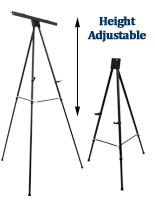 Tripod fixtures require adjusting each leg but some models have designs with a single extending pole. 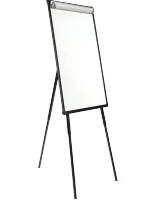 Presentation board stands with dry erase boards have a dual-use function that excel for schools and offices. These write-on fixtures give note-takers options for how they want to record information. Write it down on a paper pad or mark it on an easy-to-erase markerboard? You decide! Each dry erase board is magnetically receptive to easily pin print-outs and other sheets. Browse our markerboard accessories, including utensils, erasers, and magnets for a fully featured flipchart/whiteboard display. 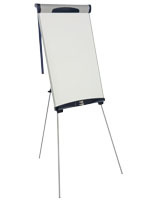 Flip charts with wheels are great for large offices and schools that share supplies. These note-taking tools for meetings and lectures are easy to roll into classrooms and conference rooms. Wheeled flipcharts create an affordable solution for recording information in organizations with a tight budget. Why choose these flip pad holders over other options? These boards offer a convenient way to quickly jot down info from a presentation or meeting. It's easy to start writing with a pen or marker on a piece of paper and rip it off the pad at the end. Save the sheet to keep your organization's strategy and goals in mind. Simply write, rip, and repeat!